From Middle English orenge, orange, from Old French pome orenge (“Persian orange”), literally “orange apple”, influenced by Old Occitan auranja and calqued from Old Italian melarancio, melarancia, compound of mela (“apple”) and (n)arancia (“orange”), from Arabic نَارَنْج‎ (nāranj), from Persian نارنگ‎ (nârang), from Sanskrit नारङ्ग (nāraṅga, “orange tree”), from Dravidian (compare Tamil நார்த்தங்காய் (nārttaṅkāy), compound of நரந்தம் (narantam, “fragrance”) and காய் (kāy, “fruit”); also Telugu నారంగము (nāraṅgamu), Malayalam നാരങ്ങ (nāraṅṅa), Kannada ಕಿತ್ತಳೆ (kittaḷe)). For other similar cases of the incorrect division (or, elision/rebracketing) of the above Italian word, but in English, see Category:English rebracketings. For the color sense, replaced Old English ġeolurēad (literally “yellow-red”); compare English blue-green. An evergreen tree of the genus Citrus such as Citrus sinensis. The colour of a ripe fruit of an orange tree, midway between red and yellow. Orange coloured and flavoured cordial. Orange coloured and flavoured soft drink. Jeff winked his eyes sleepily open and looked out into the cool flush of early morning. The east was oranged over with daybreak. I looked at him through my binoculars, his little lips oranged with Cheeto dust. It will be followed by a disappearance of the cash I had hidden in a sealed envelope behind the oranging Modigliani print over the living room couch. "What about his eyes?" / "Nothing. No oranging at all, from what I could see. Short form of late Old French pume orenge or pomme d'orenge, which was calqued after Old Italian melarancia (mela + arancia). The o came into the word under influence of the place name Orange, from where these fruits came to the north. See orange (English). Il pressa l’orange afin d’en extraire du jus. He squeezed the orange to extract juice from it. Les premiers TGV atlantiques étaient orange. The first Atlantic TGV trains were orange. 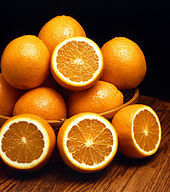 While theoretically the adjective orange is invariable, being (originally) a colour name derived from a noun, the nonstandard plural oranges is in use. “orange” in le Trésor de la langue française informatisé (The Digitized Treasury of the French Language). From the noun Orange (“orange fruit”), from French orange. The adjective has two sets of forms. In the formal standard language, endings are added directly to the stem (orang-). In less formal style and in the vernacular, another set of forms is used in free variation, in which an -n- is infixed before the endings. It is also officially correct to leave the adjective entirely undeclined. This usage is rare, however, and seems dated. Borrowed from French orange. See English orange.